Looking to have some fall family fun? Head to Cherry Crest Adventure Farm in Lancaster PA. Last weekend my family and I visited the family friendly farm that has something for everyone. 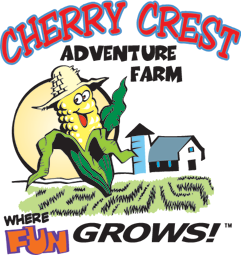 Cherry Crest Adventure Farm is a 15-acre farm, with 50+ Farm Fun activities, including the Hay Chute Slide and Straw Bale Racer, Jump Pillow, Farm Tour Wagon Ride, Petting Zoo and Farm Experience Center, Corny’s Ball-cade, and everyone's favorite the Corn Maze. They have thought of everything to keep everyone having fun! Forgot your stroller or the kids tired of walking rent a wagon for the day. Kids hungry their are plenty of options for the family to get something to eat or drink. Cherry Crest has been open for 20 years and this year the corn maze is a locomotive just like it was 20 years age. I loved the fact the there were 3 options when going through the maze, Easy, intermediate and advanced. The advance takes the longest to complete 3.5 to 4 hours and the easy takes under 30 minutes. There are different stations that you can visit while going through the maze where you can get clues on how to get out of the maze. If you get hungry to need to use the bathroom while in the maze no worries they have food and bathrooms in the maze. After the maze you can enjoy the many activities around the farm the will certainly tire your family out after a day at the farm. Looking for more adventure? Hop on the Strasburg Railroad you can by tickets inside the farm and catch the train. The Pumpkin Madness Fest begins at 12 noon with Corny’s Costume Parade – for kids who come in family-friendly costumes (no masks permitted). Cherry Crest’s mascot Corny will be joined by the Pumpkin Princess for the parade and to greet guests throughout the day. Reverse Pumpkin Darts – where you will hurl pumpkins at a board filled with pointy darts! Pumpkin Shotput Contest – carefully monitored, where competitors with the farthest throws in their category win a Cherry Crest Adventure Farm season pass! Pumpkin Ring Toss - based on the classic carnival game with various levels for different ages. Notes from the Sky Pumpkin Drop – where your pumpkin is hurled from the top of a giant boom lift and crashes onto the target below. The bigger the pumpkin the better the splat! People really have fun with this as they can write messages on their pumpkins which are read over the microphone before they’re dropped! Pumpkin Smashing – with a big rubber mallet – very therapeutic for all ages! Pumpkin Bowling – for kids age 10 and under. Pin-the-Face-on-the-Pumpkin – a play on Pin the Tail that’s perfect for small children. Flyby Pumpkin Pie Drop – at 3:45 p.m.,where you can watch parachuted pies fall from the sky, just for fun! Flyby Candy Drop – at 4 p.m., where kids age 12 & under can grab all they can as a plane drops the goods from 200 feet. at 3 p.m. see a 800+ pound pumpkin fall from the giant crane. at 5 p.m. the Grand Finale Giant Pumpkin Drop starring the largest pumpkin we can find. The largest to date – at 1,744.5 pounds – is the record to beat this year! No worries if you can't make it for a visit this fall, they will open again in the spring for more fun adventure. * Disclosure: Thanks Cherry Crest Adventure Farm for arranging for our complimentary visit to facilitate this review. As always all thoughts and opinions are our own.